The first “Escape Plan” back in 2013 was an “ok” movie, not great and definitely didn’t warrant a franchise. Iam not sure what Sylvester Stallone was thinking about when he agreed to do not one sequel but TWO for “Escape Plan”. Oh wait I know…$$$$$. What’s sad about this film is that it is the truly first low budget direct-to-video release for Stallone since “Eye See You” in 2002. Anyone remember that bomb? I didn’t think so. Stallone just got nominated for an Oscar back in 2015 and then this…so I am honestly sad because this film is such a mess that it is nearly hard to watch…and I seen it twice now. I was hoping that I missed something the first time but it is a true bomb and the whole film just wastes time to setup the third film! WHY?! Arnold Schwarzenegger smartly stays away from this sequel but Curtis “50 Cent” Jackson returns for what feels like a useless role. Same goes to Dave Bautista! This dude is on the top of his game with the “Guardians of the Galaxy” franchise etc and yet he is in a film like this. I don’t understand. I don’t even think any of these people of in the same scene together. “Escape Plan 2: Hades” is directed by Steven C. Miller. He has become the go-to low budget action direct-to-video guy with recent forgettable films like “Extraction (2015)”, “Marauders (2016)” and “First Kill (2017)”, which all happen to star Bruce Willis (another actor that has gone to the straight home video market). Let’s hope the third movie makes up for this one. Official Premise: Years after Ray Breslin [Academy Award nominee Sylvester Stallone (Best Supporting Actor – Motion Picture, Creed, 2016)] fought his way out of the escape-proof prison called “The Tomb,” he’s organized a new top-notch, for-hire security force. But when one of his team members goes missing inside a computerized techno-terror battle-maze known as HADES, Breslin together with Trent DeRosa (Dave Bautista, Guardians of the Galaxy) must now decipher a way to break into the world’s best hidden prison, release their kidnapped team, and make it out alive. Even though the film is what it is, the Blu-ray is solid and comes stacked as a combo back with a Blu-ray + DVD (anyone still use these) and a digital copy. The film feels low budget and doesn’t carry the same scale as the first film (which had a $70 million budget). The look of the film is cheap but the sound is solid. The DTS-HD Master Audio 5.1 works well with the action, when there is any. I was honestly shocked to see there was extras included. 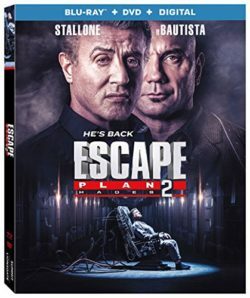 There are three features including: “Making Escape Plan 2: Hades”, “Creating the Look of Escape Plan 2: Hades” and “Building the Robot of Escape Plan 2: Hades”. Lastly there are a few more Extended Cast / Crew Interviews, worth taking a look if your really bored.